Italian-made, London-designed, leave it to Jonathan Aston to come up with a warm, yet fashionable accessory for your winter wardrobe. Jonathan Aston Snug Leg Warmers are dense, yet light knits with a broad rib detail, a double layer cuff at the top and finished with a single layer cuff at the bottom, worn next to (or even under) the foot. These soft, single colour footless knits can be pulled high or scrunched low, to layer boots or add cosy style to the ankles. 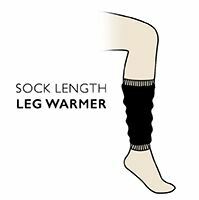 Everyone’s collection needs a pair of leg warmers, so why not these quality Jonathan Aston Snug Leg Warmers?